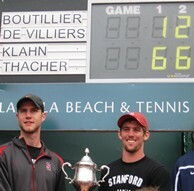 Ryan Thacher (l) and Bradley Klahn, winners of the 122nd Annual Pacific Coast Men's Doubles Championship. Ryan Thacher (l) and Bradley Klahn pose with their trophy after winning the title. Ryan Thacher (l) and Bradley Klahn are all smiles after winning the 122nd Annual Pacific Coast Men's Doubles Championship. LA JOLLA, Calif. – Playing with dominating confidence, co-No. 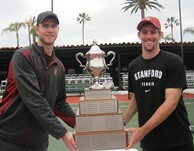 1 seeds Bradley Klahn and Ryan Thacher of Stanford University captured the 122nd Annual Pacific Coast Men's Doubles Championship with an impressive 6-1, 6-2 victory over sixth-seeded Remi Boutillier and Rikus de Villiers of Fresno State University. The Stanford duo, both left-handers, were given little resistance in Sunday’s championship match, played under overcast skies and cool conditions at the La Jolla Beach & Tennis Club. "We got off to the good start with a lot of energy," said Klahn, the reigning NCAA singles champion. "We had to fight hard for a couple of key points, and we managed to raise our games at the right times." Klahn and Thacher, who lost in the tournament finals last year, won six consecutive matches without the loss of a set to win the title. Their names will be added to a long list of tournament champions, which includes Don Budge, Jack Kramer, Pancho Segura, Stan Smith, Arthur Ashe and John McEnroe. "It's really great to add our names to the list of champions," said Klahn, who is a native of nearby Poway. "We were very determined to win this year, so we made sure to get our competitive juices flowing right away." Earlier on Sunday, Boutillier and de Villiers reached the final by defeating Matthew Kandath and Denis Lin of Stanford, 6-3, 7-6 (6), in a semifinal match. In the second semifinal, Klahn and Thacher eliminated Clarke Spinosa and Thibaut Visy of the University of San Diego, 6-2, 6-3. For the complete tournament draw, click here. Recently named "Club of the Year" for 2011 by the San Diego District Tennis Association and one of the "Top 25 Tennis Resorts" by Tennis Resorts Online, the La Jolla Beach & Tennis Club's reputation as a top tennis destination started when it attracted its first major tournament – the Pacific Coast Men's Doubles Championship in 1942. The Annual Pacific Coast Men’s Doubles Championship is one of the five-oldest tennis events in the world and has a rich tournament history. First held in 1890 at The Hotel Del Monte in Monterey, Calif., the event was created to promote the sale of real estate on the Monterey peninsula. The original concept pitted the best players from the East vs. those from the West. This coast-to-coast rivalry was the inspiration for the Davis Cup. Past winners of the Pacific Coast Men’s Doubles Championship include Jack Kramer, Ted Schroeder, Bobby Riggs, Pancho Segura, Don Budge, Tony Trabert, Stan Smith, Bob Lutz, Arthur Ashe, Dennis Ralston, John McEnroe and many other world-class champions. About the La Jolla Beach & Tennis Club, Inc.
One of California's most treasured beachfront resorts for more than 75 years, the La Jolla Beach & Tennis Club is a fourth-generation, family-owned and operated company dedicated to the operation of a 14-acre beachside resort. The resort includes three properties, including the exclusive La Jolla Beach & Tennis Club, the 128-room La Jolla Shores Hotel and landmark Marine Room restaurant. Resort amenities include 14 championship tennis courts, a nine-hole Par-3 golf course, two swimming pools, two additional oceanfront restaurants and cocktail lounges, and one of Southern California’s only private beaches. For more information, visit www.ljbtc.com.